Today, the company Gaznat SA and EPFL signed an agreement for the creation of two new research chairs. The first one will study ways to seize carbon dioxide (CO2) at its production source and increase its value through its derivatives. The second will be devoted to underground CO2 storage and geo-energy. Capture and sequestration are techniques considered to reduce carbon dioxide (CO2) emissions to the atmosphere. However, the solutions currently under review, particularly in the context of industrial activities, are very expensive. In order to stimulate research and encourage the development of new technologies in this field, the company Gaznat and EPFL signed an agreement today for the creation of two new research chairs. They will focus on the fields of CO2 chemistry and geo-energy and will be operational by spring 2015. The first chair will be responsible for finding solutions to capture, at its source, CO2 derived from industrial activities. 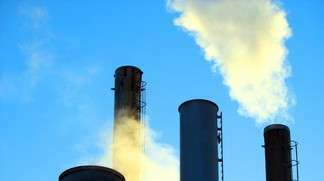 This will include developing and testing new methods and materials able to separate more easily carbon dioxide from combustion gases released into the air through smokestacks. This chair's role will also be to study CO2 chemistry so as to synthesize new molecules and increase their value as carbon sources demanded by the industry, like liquid fuel or other derivatives. "With this chair, an authentic center specializing in carbon capture and recovery will be created," notes Paul Dyson, chemistry professor and director of the Institute of Chemical Sciences and Engineering at EPFL. The second chair, which will be part of the School of Architecture, Civil and Environmental Engineering (ENAC), follows the creation of the Petrosvibri chair in 2010 (a company owned by Gaznat and Holdigaz), that focuses in the study of long term CO2 underground storage. To set the conditions for a safe and effective geological sequestration, this new laboratory will analyze the interactions between carbon dioxide and the rocks where it will be pumped into. In such a way, the laboratory will gain a better understanding of the Swiss subsoil and will be able to reveal useful information regarding the risks, potential and opportunities related to hydraulic fracturing technology. This new chair will also work on renewable energy sources such as deep geothermal energy, as well as the exploitation of hydrocarbons known as "conventional" and "unconventional" – the latter not coming from a permeable reservoir rock. "This chair will also provide an edge in such fields for civil engineering students," adds Lyesse Laloui, tenured professor holding the Petrosvibri chair. As for Gaznat, the creation of these chairs is in accordance with the drilling conducted in 2010 by the Petrosvibri company in lake Geneva, which confirmed the presence of natural gas in the "Noville" geological structure. It also echoes the commitment the gas company made this spring with several other European companies to achieve a neutral carbon natural gas transport infrastructure by mid-century. Finally, it is part of the Confederation's 2050 Energy Strategy, which refers to the reduction of CO2 emissions. "This double signature constitutes a great opportunity, commented Philippe Petitpierre and René Bautz, President and CEO of Gaznat. Research conducted within the framework of these chairs brings innovative economic solutions in the areas of transportation, storage and manufacture of carbon derived products. Gaznat is thus committed to society by supporting EPFL's academic development and its contribution to the development of research in important fields for the community. " Great idea. Turn the liability into an asset. It is done through integration with other processes.